Currently undergoing conservation, The Nativity will be going back on display in the European Old Masters Gallery at Bristol Museum & Art Gallery very soon. In the meantime, here you can read about the painting itself and also about some very exciting scientific investigations which are being undertaken on it. 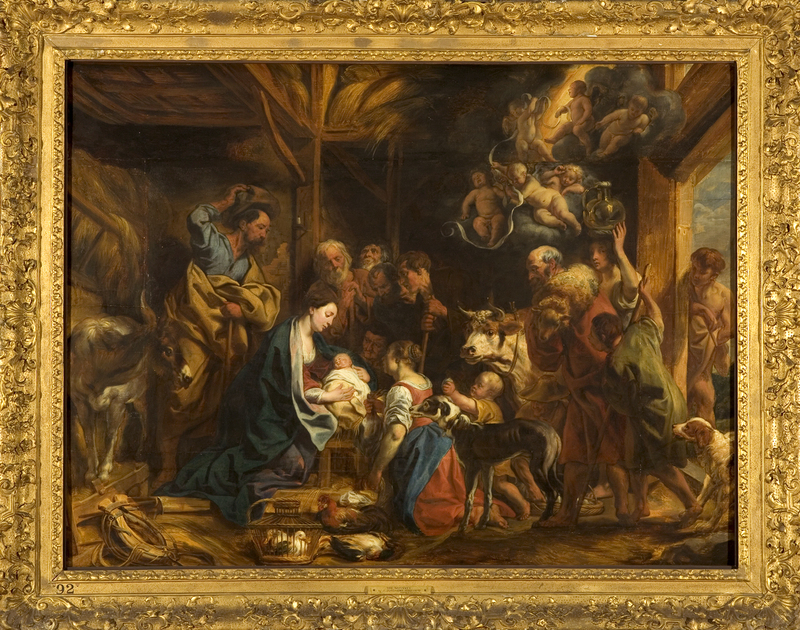 Jacob Jordaens’ The Nativity from c.1653 shows a crowded stable scene, with the shepherds, as well as other figures and animals, gathered around to see the newborn Christ child cradled in Mary’s arms. In this painting of the biblical story the holy figures are placed within the busy hub of everyday human activity. Jordaens was one of the most famous painters of the 17th Century. He was born in Antwerp in 1593 and remained there for his entire life and career until his death in 1678. As a follower of Rubens, the influence of this other great Flemish artist is evident in his work and after the death of Rubens and Van Dyck, Jordaens became the leading Flemish Baroque painter of his day. Although Jordaens’ paintings were influenced by Rubens, he showed an increased concern with realism. This is clear in this Nativity scene, where the holiest of events has a sense of familial closeness, as though we are not just witness to the birth of Christ but also to an intimate family scene. The many faces of both people and animals are all straining to marvel at the Christ child. Individual gestures heighten the sense of great excitement; the female figure kneeling at the foot of the manger is clutching a bird in her hand in anticipation. Likewise, standing behind the manger, a male figure lifts his hat so that he might get a better view of the spectacle. At the centre of the painting we see Mary holding the newborn Christ. They are lighter than the figures surrounding them, which not only serves to highlight them as special and holy but also draws our eye to this encounter between mother and child within the bustle of the stable. This is thought to be the biggest Jordaens panel painting in UK, with it possibly even being from Jordaens’ own house. Exciting investigations have been taking place in our conservation lab recently. The Nativity, one of our most popular paintings, has been under the watchful eye of Dr. Andrea Seim as she tries to uncover more information about it. Andrea is the lead dendrochronologist from The Jordaens Van Dyck Panel Paintings Project (JVDPPP). The group are studying oil paintings on oak panels by Jacques Jordaens and Sir Anthony Van Dyck in a groundbreaking combination of new scientific examination together with new archival research and traditional art historical scholarship. To date, the team has studied 135 paintings across the world. The technique is called a ‘micro-invasive dendrochronological examination’. Deriving from Ancient Greek: (dendron), meaning “tree limb”, (khronos) “time”, and (-logia) “the study of”, dendrochronology has become important to art historians in the dating of panel paintings. It can determine the possible felling date of the trees that were then made into the panels and, therefore, the approximate date of use by the painters and their studios. In addition to dating, the process can also provide information as to the source of the panel. Many Early Netherlandish paintings have turned out to be painted on panels of “Baltic oak” shipped from the Vistula region. These oak panels were used in a number of northern countries such as England, France and Germany. 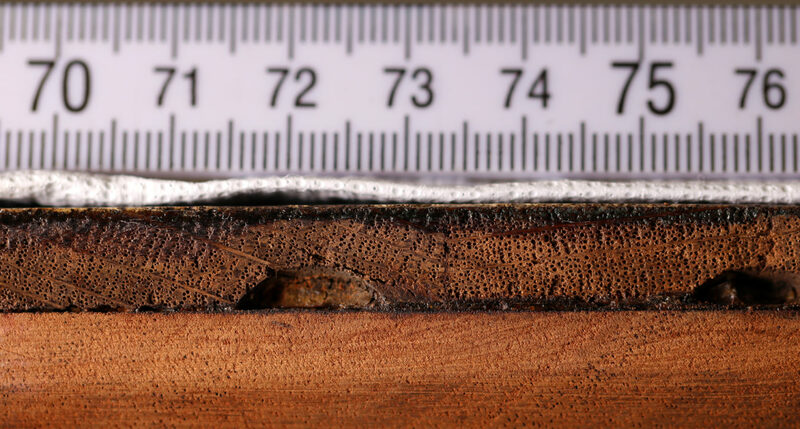 Here you can see tree rings (also called growth rings) which are dated to the exact year they were formed in order to analyze atmospheric conditions during different periods in history. As well as being one of the stars of the European Old Masters collection, Jordaens’ The Nativity has some fascinating secrets hidden beneath the surface. Underneath the central part of the Nativity scene we see today is another painting, which Jordaens apparently finished but discarded, turning the portrait-format original panel round by ninety degrees and completely painting over it. 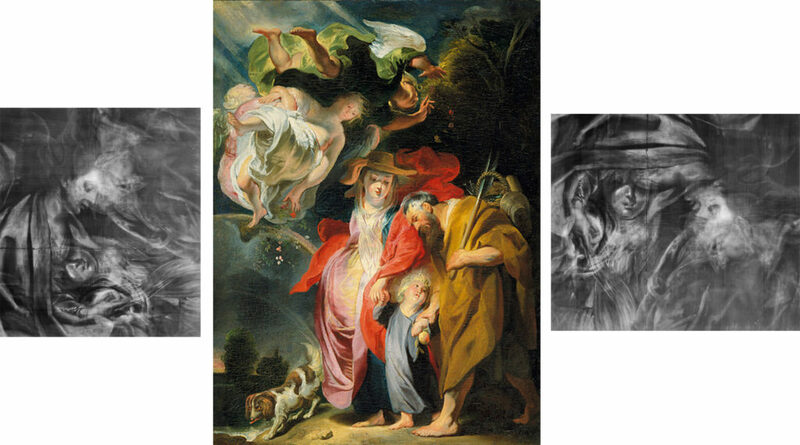 We can see parts of this painting in x-rays made in 1979, and it can be identified as an image of the Holy Family returning from Egypt, almost identical to another version he painted, and which is now in the Rhode Island School of Design Museum, USA. To paint The Nativity, Jordaens extended the original panel with 11 more pieces of wood, to make it a more imposing size, and made changes to his composition while painting. The x-rays show that there was originally one more cherub at the top, but he decided to paint this out and not have it as part of the final image. The x-ray also shows that the cherub on the right also originally had its leg in a different position from that visible now. Tools like x-rays allow us to get a bit closer to the artist by seeing how he worked things out as we painted. This, and the other investigations currently being done, mean that we are finding out more and more about this beautiful and important painting before it goes back on display next year.